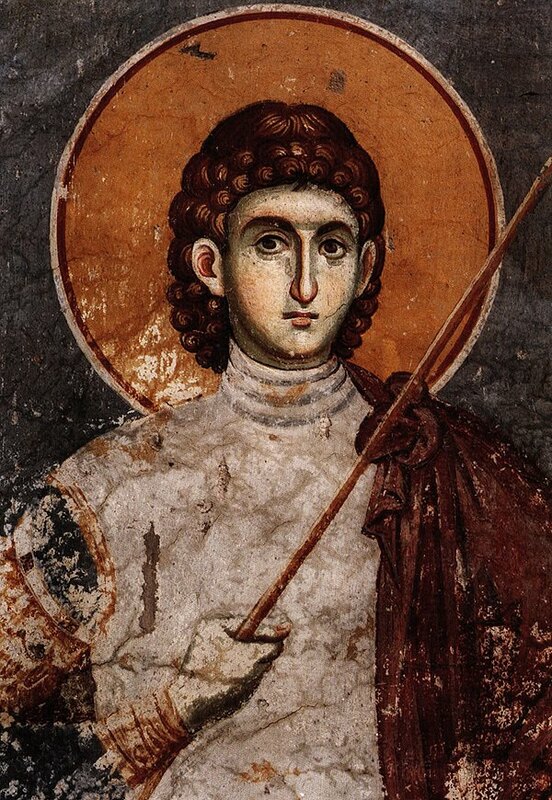 Today is the Feast of St. Propokius the Great Martyr, the patron saint, as it were, of this blog. He was originally named Neanius and was from Jerusalem. Though his father was Christian, he was primarily raised by his pagan mother Theodosia because his father died when he was young. They were a prominent family in the Roman Empire. After receiving an excellent education, he was personally introduced to the Emperor Diocletian. He quickly rose through the government ranks when in A.D. 303 Diocletian began his great persecution against the Christians. Neanius was sent to Alexandria as a proconsul to rid the city of Christians. On his way, Neanius encountered the risen Christ in a vision similar to that of Paul where both men were confronted with the question, “Why do you persecute me?” Like Paul before him, Neanius turned away from the role of persecutor to that of preacher. His mother eventually turned him in and he was sent in chains to Caesaria in Palestine. There he was tortured and was repeatedly visited by Christ who gave him the name Prokopius. He thus was able to stand up to all the tortures the pagans threw at him, steadfastly proclaiming his faith in Christ. Finally, frustrated at the immovability of Prokopius’ faith, the governor ordered that he be given the citizen’s death of decapitation (thus admitting that the crime the Christians were accused of —treason — was a lie). Inspired by the firmness of that saint’s faith several of the Roman guards responsible for guarding the saint while he was held in prison, including the tribunes Nikostrates and Antiochus, several women of the court as well as his own mother all proclaimed their faith in Christ and followed Prokopius in martyrdom. They, too, are commemorated on this day. I first met Prokopius on Mt.Athos. I had injured my foot and was waiting to see if there were any monks or facilities at the monastery I was staying that might determine if I had broken a bone or done something as severe. I was attracted to a particular icon of a soldier saint and spent virtually the whole time waiting gazing upon this saint wondering who he was. After being attended to (in what looked like to me a state-of the-art facility by a doctor become monk from Mexico City) I was given some medication and sent on my way. I eventually visited six monasteries on the mountain and every time I went to church (every morning and evening) I found myself in front of an icon of this same saint, regardless of which monastery I happened to be staying. I eventually inquired and found out this saint was, in fact, Prokopius the Great Martyr. He has (obviously) been watching over me ever since. I daresay things have changed for the better since then. In the last 8+ years there have been a number of civil discussions about Christianity and its role in RPGs. No longer does the mere mention of Christianity automatically generate a cringe from the RPG world. In fact, I have a sense that a number of folks out there have come to realize that Christ can in fact speak to the the way they play the game and to the worlds that they build. Credit must be given to Christ Himself for much of this, through the intercessions of St. Prokopius, but I would be disingenuous if I did not credit all those gamers out there who have read this blog and told other people to read this blog. There are a bunch of people out there in this corner of the internet who were able to look beyond their own prejudices to see that these games we love to play bind us together in ways that reach beyond those prejudices, beyond the borders and walls we build around ourselves. For that I must thank each and every one of you and am proud to be a part of this little corner of the internet that continues to defy the convention that people from different backgrounds and different beliefs cannot understand each other. You know, I never bothered to research just who the heck Prokopious was. Thanks for the info. I've written it before (I hope) but it's worth writing again: your contribution to the discussion of D&D is a welcome one, and one that I (and your other readers) greatly appreciate. Not everyone can bring the theological perspective that you can...I know I can't! I am very glad you continue to blog, in your own way and your own style. Thanks, JB. I appreciate it more than you know.